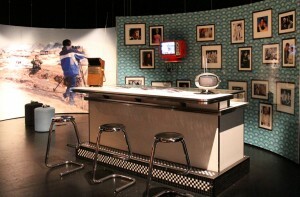 This exhibition presents a selection from Moses Znaimer’s collection of vintage television sets conserved by the Cinémathèque québécoise, and gives an overview of more than fifty years of television by showing how the sets evolved from the 1930s to 1999. From the start, television imagined and produced its audience as a participant by including it in its discourses. This exhibition paints an aesthetic, historical and technological portrait of the television era in Canada through selected views of the global village.